For over 75 years GWA Bathrooms & Kitchens brands, such as Caroma, Fowler, Stylus and Dorf have been a part of life in Australia. A wholly owned subsidiary of GWA International Limited, GWA Bathrooms & Kitchens is a Brisbane-based, Australian managed company with diverse interests in the building products industry and related companies. Our reputation for innovative thinking stretches back to our founding fathers. In 1837, the Fowler brand began manufacturing sanitaryware. Dorf was established in 1948 by Keith Hooper, an admirer of Henry Ford. He decided to switch the letters in the word ‘Ford’ to create the innovative tapware brand we know today. Caroma was founded in 1941 by Charles Rothauser and his wife Roma when they developed the first one-piece plastic cistern, winning the first of many awards for Caroma including the FH Edwards Laurel in 1956. In 1980, Caroma introduced the world’s first dual flush toilet, which continues to save millions of litres of water each year. Caroma and Dorf remain to be some of Australia’s most widely recognised brands and continue to provide innovative solutions for everyday Australians and professionals alike. Our Research & Development team, under the leadership of Dr. Steve Cummings, is recognised globally for its water saving achievements. Over the years, our products have saved Australia and the world billions of litres of potable water, the world’s most precious resource. 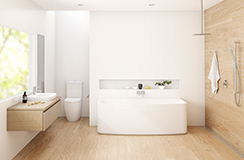 As the leading manufacturer of Australian bathroom products, GWA Bathrooms & Kitchens has always made sustainability the focus of product performance. Commercialised the dual flush button system. The 6/3 litre dual flush cistern. 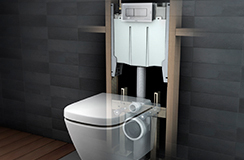 The 4.5/3 litre dual flush cistern with Smartflush® technology. 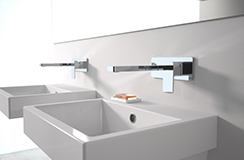 Industry first WELS 5 star rating for toilet suites with the new Profile toilet suite with integrated hand basin. Today, our Research & Development team is dedicated to continuing our reputation for innovation with a focus on developing the latest water-saving technology. Every product we make is designed and built to respond to society’s changing needs and an ever-increasing desire for efficiency and environmental consciousness. Our products meet relevant Australian Standards, WELS certification and Codes of Practice for new build and retrofit applications. Above all, bathroom and kitchen products need to be desirable, practical and functional. 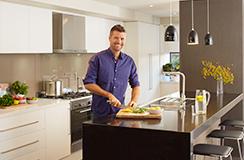 At GWA Bathrooms & Kitchens, we’re committed to leading the way in developing groundbreaking industry innovations to ensure we continue to provide these benefits to the Australian people for years to come.